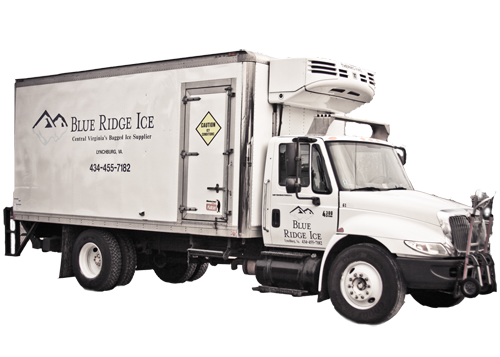 Located in Lynchburg, Virginia, Blue Ridge Ice is centrally located to deliver ice along U.S. Routes 460, 29, 501 and several other main and smaller corridors in Central, Southern and Southwest Virginia. As an ice supplier, we wear many hats, from shipping ice to all of the retail stores in our region to fulfilling specific needs of other businesses, restaurants and organizations. We collaborate with you — our customer — at all times, ready for your ice needs in times of high demand. We are locally owned and operated right here in the heart of Virginia to provide the best service to the people that matter most, you, the customer. We believe that it is crucial that you have a reliable, continuous source of ice whenever you need it, not when it is convenient for us. All of our products are warehoused in Lynchburg and available for immediate delivery. Our bagged ice is packaged at the largest ice manufacturing facility in Southwest Virginia, Hometown Ice. They are dedicated to the highest quality standards, going as far as blast freezing (drying) and screening (removing excess snow & crumbs) before bagging the ice, making our product the highest quality in the industry. We also sell large carving blocks. These crystal clear Clinebell blocks come wrapped in plastic inside a cardboard box to protect them. They can easily be handled with hand trucks instead of ice tongs which means lot less breakage and chips. Blue Ridge Ice is here to help in any way. Our fleet of trucks is ready to head your way. Give us a call and we will help you stay cool!